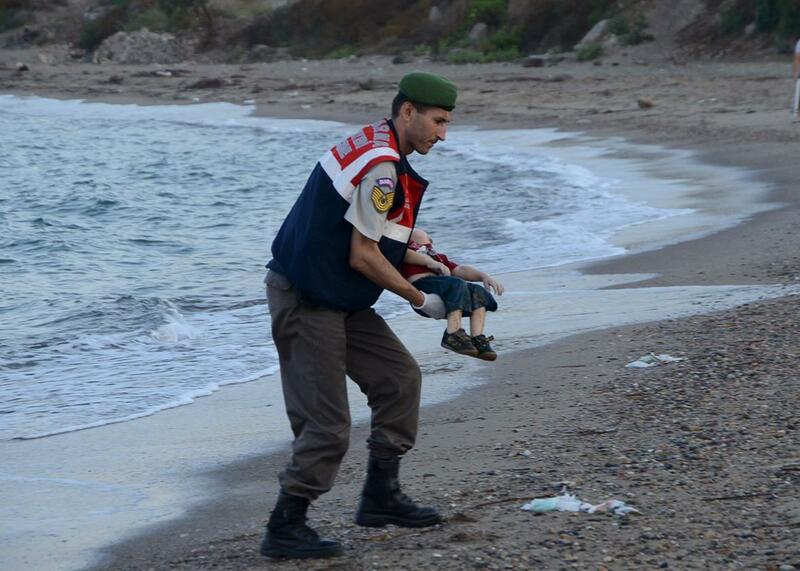 Refugee boy dies trying to escape Syria: Here is the change that is necessary to save lives. 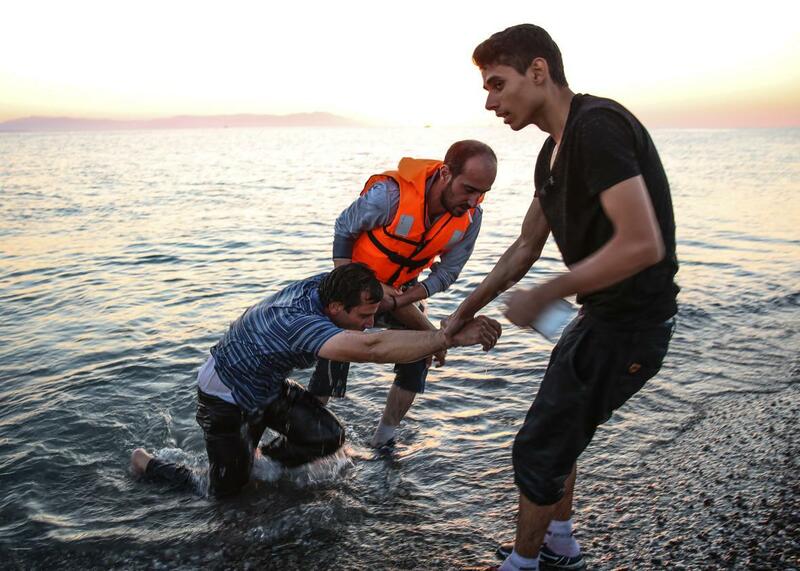 We Could Stop More Refugee Children From Drowning. But We Won’t. A Turkish police officer carries a young migrant, identified as Aylan, who drowned in a failed attempt to sail to the Greek island of Kos, in the coastal town of Bodrum, Turkey, on Sept. 2, 2015. The attention is long overdue: The death toll resulting from thousands of refugees making the dangerous journey from the Middle East and North Africa into Europe has been swelling for months, and so far, help is not on the way. 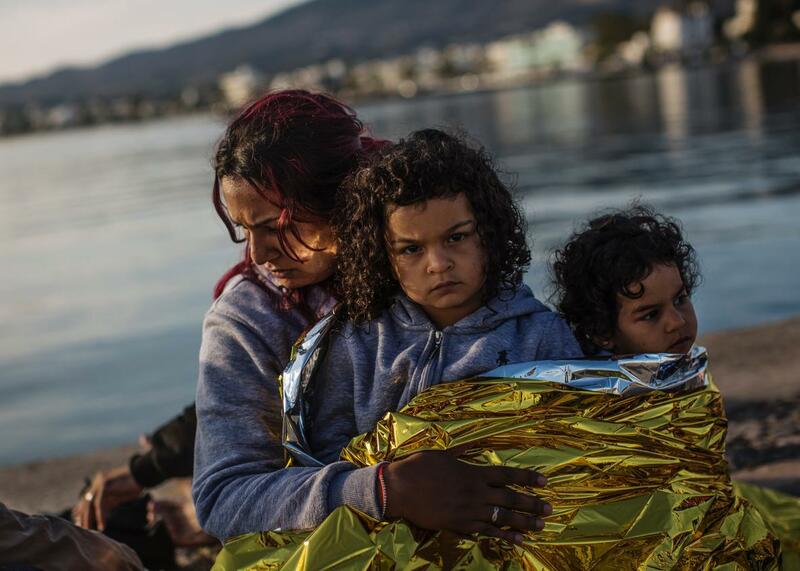 A Syrian family waits after being escorted into the harbor by the Greek Coast Guard, which found them drifing offshore on June 4, 2015, in Kos, Greece. In April, Human Rights Watch warned that as “Bulgaria and Greece have bolstered their guard forces and built fences along their borders with Turkey,” many people, including those fleeing Syria, will “attempt the more dangerous route across the Aegean Sea.” That is presumably what Aylan and his fellow travelers—including his 5-year-old brother, according to Turkey’s news agency—were doing before they drowned. Unfortunately, new fences are going up on Europe’s periphery, and more controls are being imposed on internal borders, as Europe prioritizes keeping people out over saving lives. Barring a scenario in which a young boy’s death forces Europe to change course and throw open its doors to refugees fleeing war-torn regions, what can be be done to prevent more children and their families from dying? For a year until last October, Italy had a naval operation aimed at rescuing those making the dangerous crossing from North Africa. It has been replaced by a much smaller EU–led operation whose focus is explicitly not on saving lives. Reviving maritime search-and-rescue missions could help protect refugees, especially if such an initiative were a Europe-wide effort rather than something left to Italy or another individual member state. Governments should also coordinate their efforts with groups like Doctors Without Borders who have started private search-and-rescue operations of their own. Ship owners, many of whom now actively avoid areas where they are likely to encounter ships carrying refugees, could also be compensated for diverting to rescue those in need. Opponents argue that these operations encourage people to make the dangerous crossing, since they think they will be saved should something go awry, but the current grim situation doesn’t seem to be acting as much of a deterrent. Europe must re-examine its current asylum procedure, known as the Dublin Regulation. Under this system, asylum seekers are the responsibility of the country where their claims are first processed and can be deported back to their home countries if they later try to register elsewhere. Simply due to geography, refugees are most likely to enter Europe through Mediterranean countries or the Balkans, but are really headed to places like Germany and Britain. The countries on Europe’s outer borders rightly claim that Northern European nations use the asylum rule to avoid responsibility for migrants. It’s also the reason why refugees like those found dead in the truck in Austria last week attempt to clandestinely—i.e., more dangerously—cross through countries like Hungary, where they don’t want to be detected and registered, on their way to their final destination. It’s reportedly led some refugees to take steps like burning off their fingertips to avoid detection by the EU’s fingerprint database for asylum seekers. 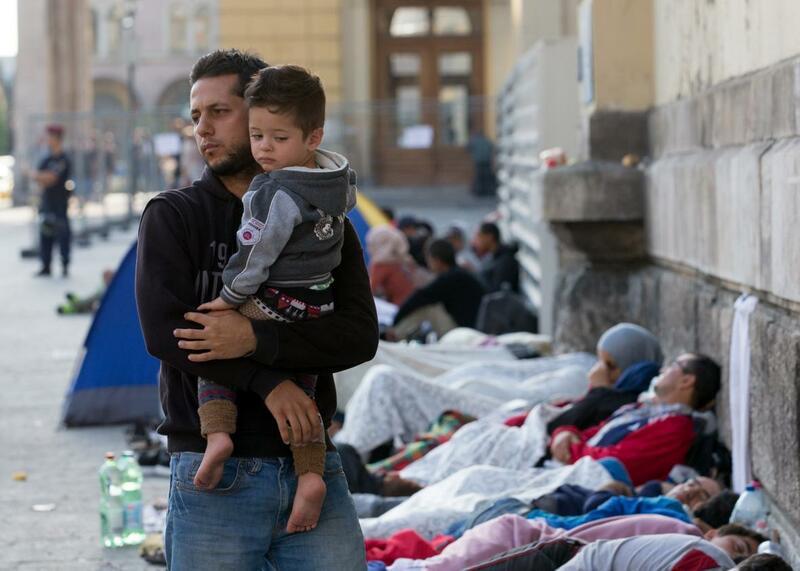 Migrants sleep outside Keleti station, which remains closed to them, on Sept. 2, 2015 in Budapest, Hungary. Open the door, at least a little. These measures would help prevent some deaths, but wouldn’t change the fact that conflicts in the Middle East and North Africa are displacing far more people than Europe is willing to take in. European governments need to decide whether they want to continue to block the entrance of refugees, watching many die as a result, or allow more in. Not all countries have reacted the same way. Germany will take in at least 800,000, perhaps even a million, refugees this year, despite some public backlash. In contrast, just 216 people have qualified under Britain’s resettlement plan for Syrian refugees, and David Cameron—under pressure from his own supporters as well as the ascendant anti-immigrant UKIP Party—has assured the public that the number won’t rise above 1,000. Germany has called for continent-wide quotas, but the idea hasn’t met with much enthusiasm. Germany’s relatively open policy may have made Chancellor Angela Merkel an unlikely Syrian folk hero, but Austria and Hungary have blamed her for encouraging the asylum seekers causing the chaotic scenes at their railway stations. With little public appetite for taking in more refugees, growing concerns about terrorism and Islamic radicalization, and right-wing anti-immigrant parties ascendant in several countries, a more open door seems unlikely. As Bobby Ghosh recently noted, this isn’t just a European problem. For all the handwringing directed at Europe, Saudi Arabia and the Gulf states, with immense government resources as well as active participation in the Syrian conflict, have offered zero resettlement opportunities for Syrian refugees. It’s also worth pointing out that the number of refugees currently hosted in countries like Lebanon, Turkey, and Jordan dwarfs the number reaching Europe. Most of those who eventually make their way to Europe start by fleeing to one of these countries. Lebanon, a nation of just 4.5 million people, now hosts more than a million Syrian refugees. This is an unsustainable burden, and it shouldn’t be entirely Europe’s responsibility to alleviate it. Ultimately, Europe’s crisis is actually a symptom of the crisis in Syria. Not all of those heading to Europe are Syrian—significant numbers come from Afghanistan, Somalia, Eritrea, and other countries—but the 11 million people displaced by the conflict are the primary drivers of the alarming global increase in displaced people we’ve seen over the past year. There would still be a refugee crisis without the war in Syria—the chaos in Libya is also a significant factor—but it would likely be a manageable one rather than the seemingly insurmountable catastrophe we see today. Until the world, including the United States, gets serious about resolving the bloody conflict in the country, its people will continue to do whatever it takes to get out. And continue to die trying. An exhausted Syrian man is dragged out of the water after swimming the last 50 meters to shore as migrant families from Syria arrive in an inflatable dinghy on the island of Kos after crossing a 3-mile stretch of the Aegean Sea from Turkey on Aug. 28, 2015. What’s Driving Europe’s Migrant Crisis? Could Europe Have Done Anything to Stop the Migrant Tragedy?